It can take a long time to make a movie. That's especially the case with The Man Who Killed Don Quixote. Terry Gilliam's film has been on the drawing board for 29 years. Plagued by delays, funding issues and cast changes, the quest to make the film has even spawned two documentaries, including the 2002 film Lost in La Mancha. But now it's here. Adam Driver (a roll call of actors, including Johnny Depp, were originally cast in the lead role) plays Toby, an American director who is jaded and a bit of a sellout. Toby is in Spain shooting, when by coincidence, he happens upon a DVD of the student film he made 10 years ago, a low-budget retelling of Don Quixote. Frustrated by delays and problems with his current shoot, Toby realises that he made his student film in a little village that just happens to be close by. Toby commandeers a motorcycle and sets out for the village, eager to see the original cast members of his film; none were actors, they were just townsfolk. It soon becomes apparent that Toby's student film left its mark on the town. The inn-keeper laments his lost daughter, who upon Toby's advice, left for the city to pursue her acting dream. But it's the old shoe-maker who played Quixote that's haunted the most by appearing in the film. Toby's Don Quixote (played by Jonathan Pryce) has never forgotten appearing in the film - so much so that he believes he is Don Quixote. Much to Toby's dismay, the old man also now believes Toby is his trusty sidekick, Sancho Panza. And so the two set off across the Spanish countryside. The old man looking to avenge wrongs; Toby trying to figure out what the hell is going on. So after nearly three decades was it worth the wait? The answer is not really. 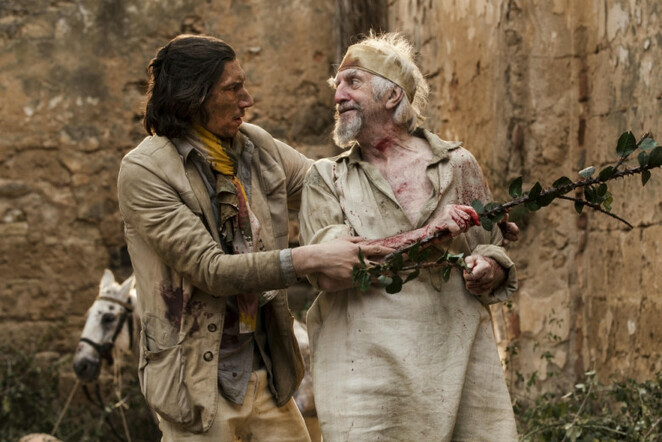 From about the point Toby leaves with the man who is convinced he's Don Quixote, things pretty much go off the rails. What follows is a series of scenes that lack cohesion, and that seem to drag on without purpose. There is some good. The highlights include the cinematography and backdrops. Rural Spain is often gorgeous, the light exquisite. But that's about it. The acting is tepid at best. Adam Driver does his best, but his character is one dimensional - Toby devolves into a boring mess, every second word a swear word. Jonathan Pryce goes headlong into Don Quixote, an old man with serious delusions, but this too becomes grating after a while. The Man Who Killed Don Quixote may have finally arrived, but you get the feeling it's been cooking too long. It's all overblown and overwrought - a tangle of scenes, many of which are very pretty, but which lack any point. It's surreal and creative, but there's nothing to latch onto, or be entertained by. I LOVE Terry Gilliam's work.